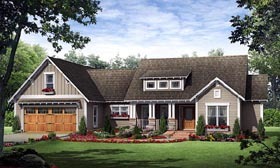 This inviting craftsman home includes all the features that you and your family have always dreamed of having. The well-appointed floorplan design makes use of every available space while providing many extras that you would expect to find in a much larger home. The entry foyer, adjacent to the formal dining, opens into the great room that features trayed ceilings as well as built in cabinets and a gas log fireplace. A second eating area is provided within close proximity to the well-equipped kitchen and features beautiful views. The kitchen also includes an eating bar and island that provides plenty of cabinet and counter space. The master suite also features trayed ceilings as well as a large walk-in closet, tub and separate shower, dual lavatories, and enclosed toilet area. The other two bedrooms are well-sized, have walk-in closets, and share a compartmented bath. The oversized garage is large enough for today's vehicles and also includes a separate storage area. This design truly features everything that makes a house a home.